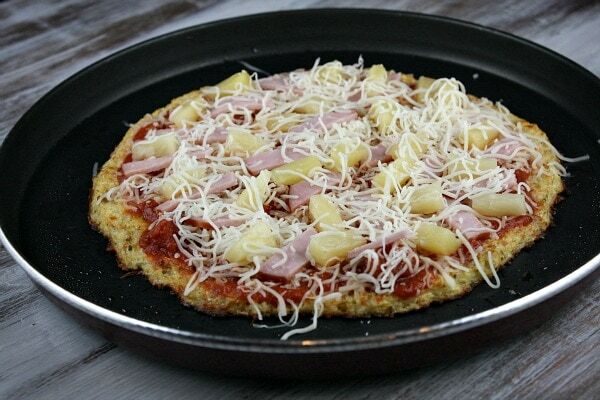 This is the best invention ever: Cauliflower Crust Pizza. Yes, you heard that right… pizza crust made out of cauliflower. I saw it on Beth’s blog, and she got the idea from a friend who got the idea from a low-carb bulletin board. It’s apparently been an idea that has been floating around for a while, but I’ve just gotten wind of it and I’m sure glad I did. This stuff is (shockingly) good! 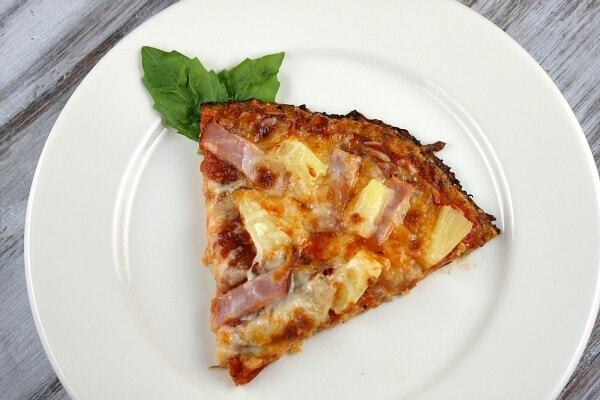 I topped mine Hawaiian style. This entire thing is incredibly simple to make! 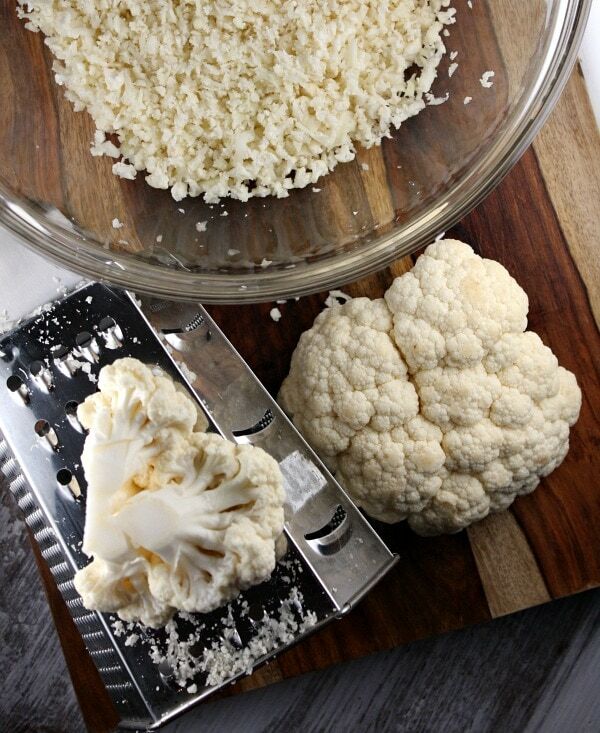 Just use a cheese grater to “grate” your cauliflower into very small pieces. You can grate a whole large head of cauliflower and make two 9-inch pizzas. Microwave those cauliflower crumbles for 8 minutes. No water or anything needed. Just microwave it for 8 minutes to soften it up, and then let it cool a little bit. 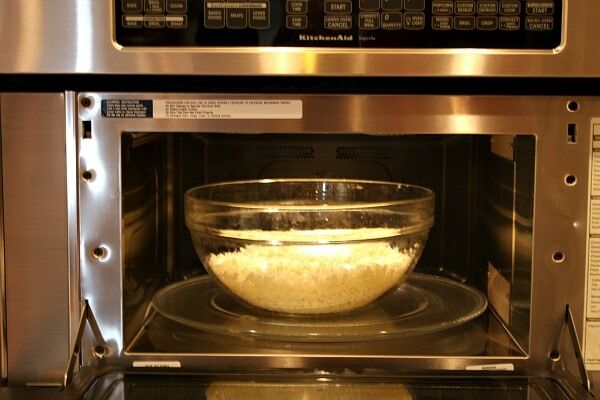 See the recipe below for how to proceed if you do not have a microwave. Shape it into a 9 to 12-inch round. Bake the crust. Top it with desired sauce and toppings. 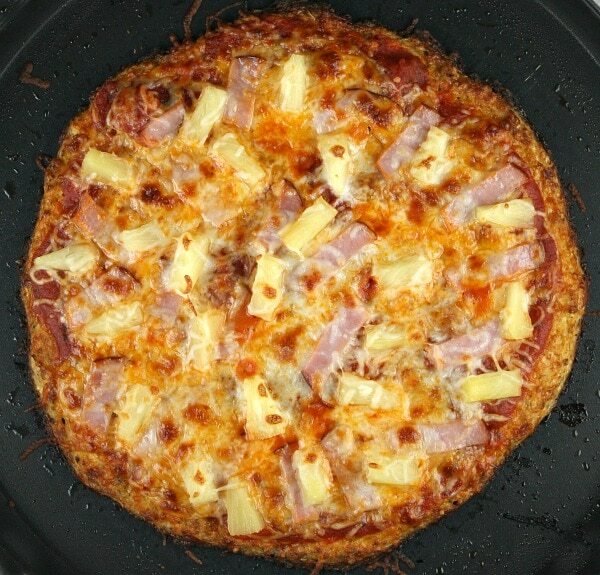 I went so simple and just used Classico Tomato- Basil marinara sauce, mozzarella cheese, Canadian bacon and pineapple (our favorite). 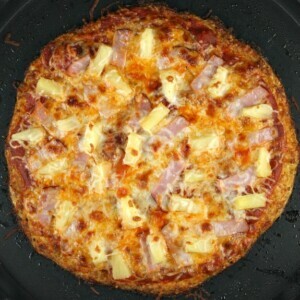 All that happens next is just a quick broil in the oven to melt the cheese and heat the toppings. That is all! The pizza can be cut into 6 slices. You’ll probably want to eat two slices. Each slice is 151 calories and 4 Weight Watcher’s Points Plus. And if you’re watching your carb intake, each slice has 9.2g carbs. In the recipe below- I also include nutritional info for just the crust (in case you’d like to create your own toppings). I was able to make two pizzas from one large head of cauliflower. My husband, my 10 year old and I all really liked the pizza and agreed that you can’t tell at all that the crust is made out of cauliflower. It doesn’t taste like “real” pizza crust, but it doesn’t have the flavor or texture of cauliflower either. You’ll have to try it out for yourself and let me know what you think! Thanks so much to Beth and her Cauliflower Pizza Crust post for inspiring me to make this myself and share it with my readers! How do you like to top your pizza? 3. Prepare the pizza: Spread the sauce on top of the baked crust, leaving a 1/2-inch border around the edge. 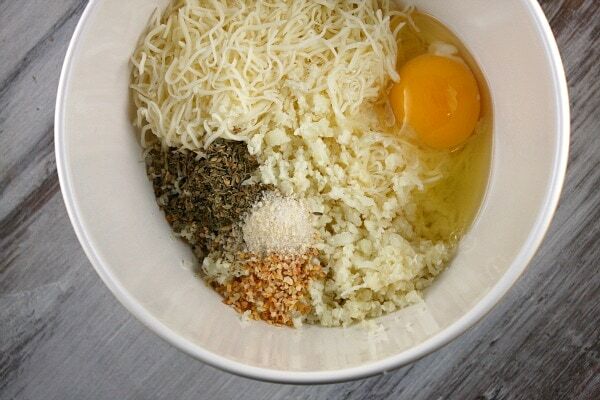 Sprinkle 1/4 cup cheese on top. 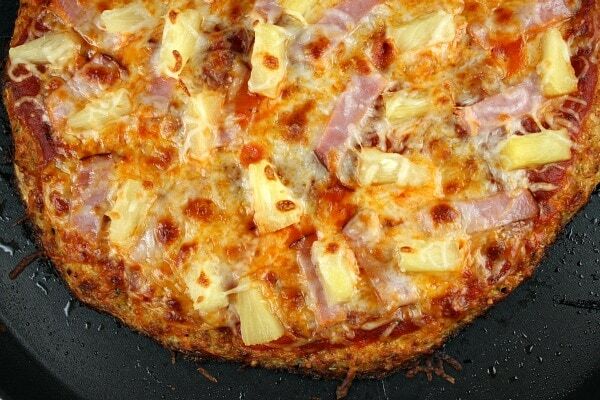 Add the bacon and pineapple, spreading it out around the pizza. Sprinkle the remaining cheese on top. Broil the pizza 3 to 4 minutes, or until the toppings are hot and the cheese is melted and bubbly. Cut into 6 slices and serve immediately. From Eat, Drink, Smile (tip from Beth): For those who don’ t have a microwave: You can steam the florets just until they are tender (not mushy) on the stove and then let them cool before grating them. The texture/consistency won’t be the same (It will be more like a puree) but it still works fine once you mix all the ingredients together. 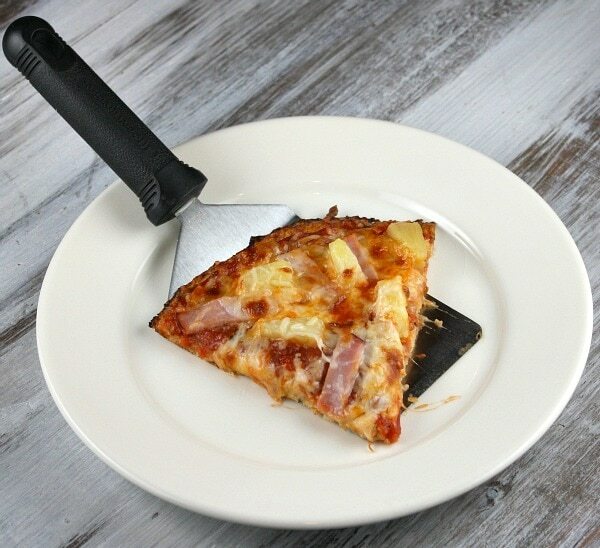 *This pizza is best served on a plate with a fork.